On this warm, rainy night, a couple strolls slowly through the French Quarter. The bright lights against the wet ground shoot bursts of vibrant color down each narrow corridor. A carefully rendered composition emphasizes the tall buildings that create the sense of being consumed in a world of one’s own. Time stands still in a scene where love and music reverberate against the ancient cobblestones. Impressionistic color softens his bold yellows, blues, and reds into a soothing, pleasant combination of warm and cool hues. So much history, so much life, the essence of this renowned city gives meaning to Flohr’s loose, colorful brushwork. 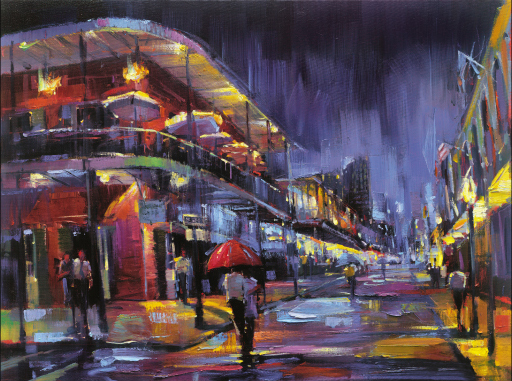 Flohr’s genius invites those whose eyes move throughout the intricacies of NOLA to be a part of his evoked memory. NOLA encourages the viewer to take their own loved one on an intimate French Quarter stroll. Known to many as the birthplace of jazz and flocked to for its world-famous Mardi Gras celebration, this french-influenced destination offers a unique environment unmatched by any other American city. Flohr’s fond emotions toward this incredible urban destination create a vibe never before felt in his work.